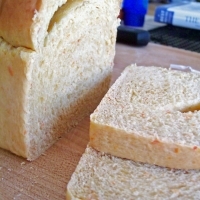 A lovely soft sandwich loaf made with white wheat flour, buttermilk, and honey. The unexpected addition of pureed carrots and a pinch of ginger give this bread a beautiful golden color and a mildly sweet flavor that is perfect for any filling, as well as a nutritional boost. Mix Dry Ingredients except salt and extra flour together in mixer bowl, set aside. In a small saucepan, mix together wet ingredients over very low heat. Bring up to just 95-100 degrees. (Watch it carefully, as buttermilk will curdle if overheated.) You should have about 1 1/8 cups of liquid. Add wet to dry, and mix thoroughly with a wooden spoon or your hands until a soft dough forms and all flour is moistened. If it's still quite sticky, sprinkle in some of the extra flour until it's just slightly tacky, but not dry. Cover with a towel and let rest 20 minutes. This is called autolyse and is an important resting period that allows the dough to hydrate, meaning you will have to add less flour later. Knead on medium-low speed for 7-9 minutes, until dough is silky and just a little tacky. Add some of the remaining flour if necessary--dough should clear the bottom of the bowl while kneading but still cling to it slightly. Transfer dough to lightly floured counter and knead into a tight ball. Move to an oiled container and let rise in a warm place until doubled, 45 minutes to one hour. When doubled, punch dough down, turn onto counter, and fold over onto itself several times. Shape into a ball, cover with towel and let rest 10 minutes. To shape dough, roll into a rectangle as wide as your loaf pan is long. Roll up jelly-roll style, pinching seam and ends tightly closed. Place seam-side down in oiled loaf pan, cover with towel and let rise until doubled, about an inch over the sides of pan, 40-60 minutes. Meanwhile, preheat oven to 350. Have an old pan on the floor of the oven, and make sure there is no rack above the rack you intend to bake your bread on. Place pan into oven, and carefully toss a cup of ice cubes into hot pan, and shut door quickly. Bake 20 minutes, then turn pan around, and bake 10-15 more. Bread will be golden brown, sound hollow when done, and will read about 195 on a thermometer. Turn onto rack to cool, brush with butter for a soft crust, and wait 30 minutes before slicing. Makes one petite loaf. Carrot Puree: In a stovetop, microwave, or electric steamer, cook 1/2 pound baby or sliced carrots until very soft (fork can easily mash them). Time will depend on the size of the carrots, but I'd say at least 10-12 minutes. Process in food processor until very smooth or mash very well with a potato masher. Tiny chunks are fine and add texture--don't add any liquid! Measure in a dry measure--you may have a little puree left over. If you want to skip this and try baby food carrots, be my guest, but because baby food usually has some water added, I would omit the water called for until you see how it's going to behave. That looks really good, I've never heard of carrot yeast bread. This IS unique to me! 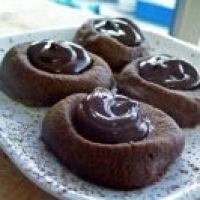 Like earthwatersunwind's recipes? Never miss an upload!